Do you have a home office? Somehow, for three women who run multiple businesses mostly from home – none of us have a dedicated “office.” We have small corners of our living rooms. We often fantasize and even looked at some office spaces to lease last year, but working near our families is part of the appeal! Even still, for those of you who are like us and work right where your family plays, you know it can be challenging! Post-it Brand has really been upping their game on tackling home organization, so we were excited (read: desperate!) to try out the new Home Collection by Post-it® Brand, Scotch® Brand and Command™ Brands! We love how the whole collection is created with flexibility in mind. Everything is installed with Command strips so you can easily change your mind, move around, and grab without damaging your walls. Here’s how we use them as moms and business owners! These Post-it Reminder Tags are so helpful! The tag simply adheres to itself so you can easily mark lunches, backpacks and coats without having to actually write on them. Post-it Reminder Tiles are great for lists and jotting down quick to-dos! Having it out in the open makes it that much easier to remember and refer back to. These tiles don’t lose their stick so no need to worry about Post-it Notes falling off under the fridge to be forgotten forever. Happens to the best of us! Post-it Magnet Grip Discs are pretty genius. We usually have a baby on our hip, so you get used to doing things one-handedly. These magnets have an open grip, so you just slide the paper, tickets, menus right in and it grabs it. All with one hand! 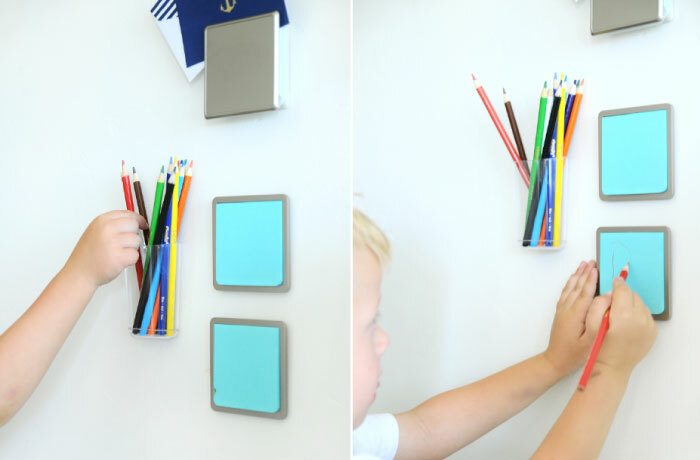 The Post-it Grip Display Rail is a sleek platinum color so it doesn’t grab your attention like a wall full of chaotic magnets tends to do. It looks intentional and allows your eye to go to the items it’s holding. 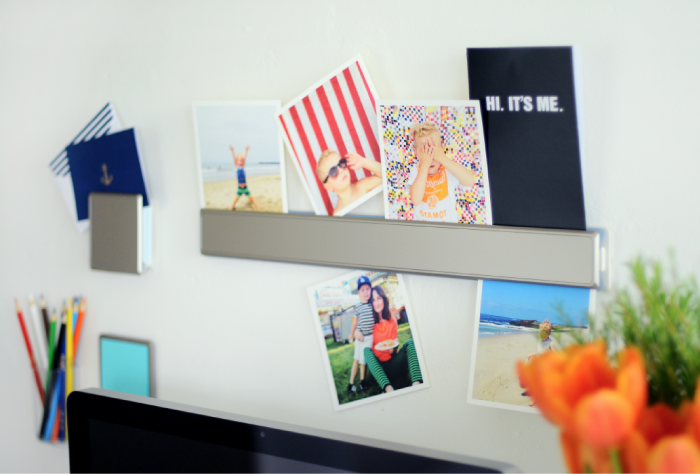 It holds lots of pictures, documents, receipts, so you don’t need to have a dozen magnets on hand. The Post-it Dry Erase Grip Tile is another great item for quick jotting, but then behind the dry erase tile it has the grippers so you can easily insert papers. If you have limited space this one is a great option! 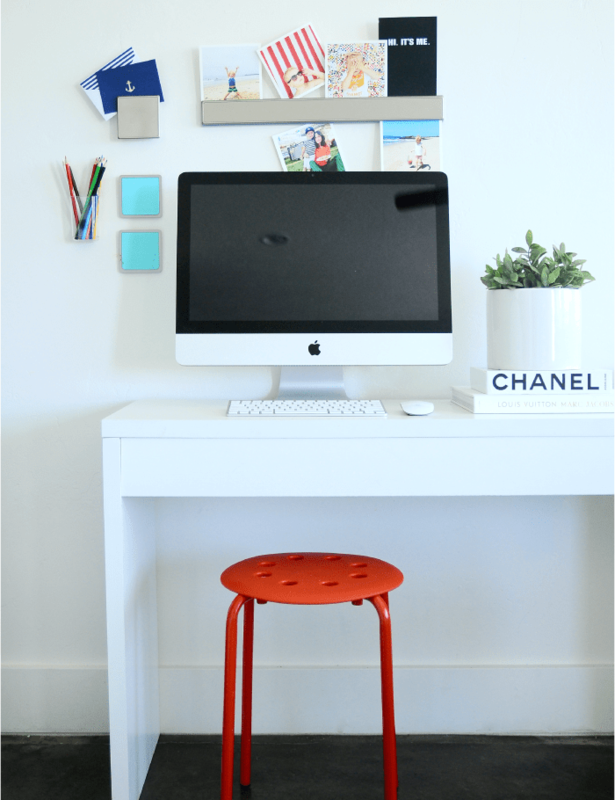 This collection has been so great for our small office nooks. One thing we will say is that without a desk and drawers, you learn to only hold onto what’s necessary, hoarding is not an option! So having additional organization for those necessary things makes us feel that much more on the ball! Check out all the Home Collection products by visiting www.postit.com/home. Find Post-it Brand on Facebook and Instagram, Twitter and Pinterest via @postitproducts! Love this! I could really use it!